This issue of Footprint follows a tripartite trajectory regarding formal studies. On the one hand, it includes reflections on the way built form is produced, while, on the other, it gathers studies that examine how architectural form appears in discursive and communicative terms. Finally, it serves as an attractor for multiple inquiries into the different relations that can be established between human actions, understood in the broadest possible terms, and the shape of the built environment. By interrelating these three approaches, the aim is to embrace and braid object-based approaches to form with approaches that examine the reciprocity of formal emergence and studies dealing with in-formation. Emulating Joseph Kosuth’s well-known triptychs, a constant problematisation of architectural form is situated between these three topical interpretations, understood as architecture’s configurative triad. Acting on the threshold of various discursive outlines, the contributions to this issue transverse several kinds of formalisms, highlighting that beyond the limitations of any specific discourse, their heterogeneous assemblage can afford the production of theoretical, methodological and conceptual innovations in the field of contemporary formal studies. 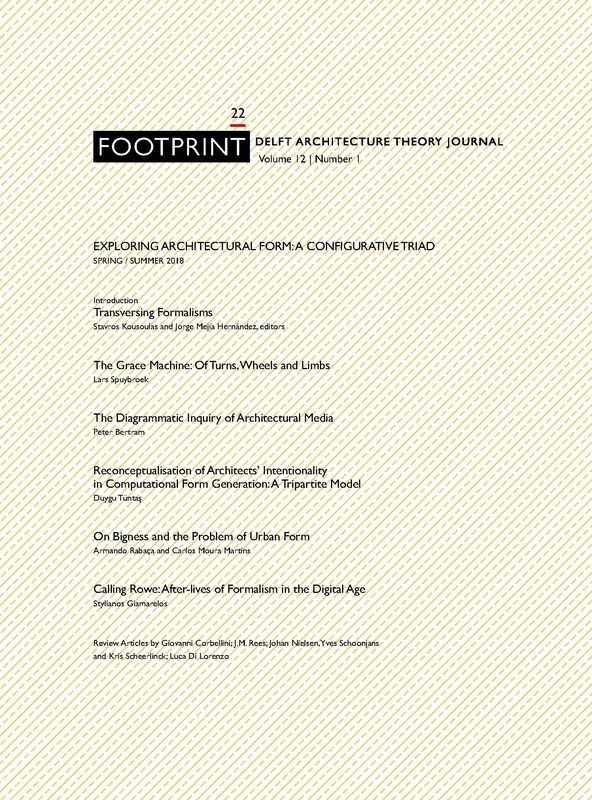 In the editorial introduction of this issue of Footprint, the question of architectural form is approached from a population of minor perspectives. Inspired by Bateson’s metalogues, the authors wish to bring forward multiple questions on architectural form instead of a single generalizing one: from ‘what is form’ to ‘how, when, where and why is form’. In this respect, they examine the ways for a possible reconciliation between the genetic and the generic, between the discursive outlines of various formalisms, opting for an approach that is both syncretic and transversal. Committed to architectural form, they conclude by claiming that it stands for much more than simply a concept. Form, in its ambiguity and heterogeneity, stands for a shared problem, one that brings together disciplines, schools of thought and variant methodological practices, turning therefore the discursive constraints of the past in productive chances for the future. The following essay revolves around the notion of the figure and its relationship with grace. The figure, both object and event, is posited as what emerges in what is called ‘the gap between habit and inhabitation’. The essay is structured in three parts that each contribute to the argument that habit and inhabitation are part of the ancient structure of grace, which extends to many domains such as religion, economy and art, but above all to technology. The first part establishes the concept of grace within gift exchange where the aesthetics of gracefulness is not defined by gesture or action, but by the combination of a cyclical rhythm and the verticality of stance. The second part restructures the cycle as one of habit, linking our relationship with technology to gift exchange, while developing the central argument of grace as a machine. The final and third part expands the role of play and mimesis in the functioning of the grace machine while defining the gap between habit and inhabitation as a double gap, consisting of a temporal axis that leads from habit to the figure of grace, which again is suspended between object and field on the spatial axis. According to the philosopher C.S. Peirce the diagram is a system of interrelated parts that operates in a manner similar to another system of interrelated parts. It is a mental map of relations. It drives an open-ended inquiry on a given problem. In architectural discourse a diagram is often defined as a particular form of drawing. It is a simplified image and/or it uses a notation system. In this context, the latter is termed a digital diagram. However, an architectural medium has material properties that influence both the making and the translation of the drawing. It is both a singular artefact and a set of instructions for actions undertaken in another space than that of the medium. This article introduces the notion of an immanent diagram to discuss how the composition of a drawing is distributed. The proposition is that the architectural diagrammatic inquiry operates in the struggle between digital and analogue diagrams. I develop the argument using a traditional architectural drawing as a starting point. In the last section, I discuss a contemporary computer based design practice in which drawings and prototype modelling constitute a heterogeneous technological environment. This paper attempts to create a theoretical framework to reconceptualise architects’ intentionality in computational form generation. Parallel to the increasing complexity of design problems and the increased realm of architects’ responsibility, the last two decades have shown that a vast amount of information can be managed and operated within the design process by using computational methods and associated technologies. This condition led to an expansion of the dominant mode in form computation that largely relies on data-driven forms as outcomes of pure calculations and rationalistic determinism. As an alternative, this study proposes a tripartite model as a basis to understand and assess design intentionality by unfolding and thereby reflecting on designers’ internalised processes. Initially defined in the field of computation, network and communication sciences for management and organisation of information, the proposed model – composed of centralised, partial and distributed approaches – is operational in responding to different forms and degrees of design intentionality within computational processes in architecture. The term ‘bigness’ refers to large-scale, mixed-use buildings and was introduced into the architectural vocabulary by Rem Koolhaas. Contrary to Koolhaas’s focus on the ‘generic city’ and the Asian context, this essay explores the role that large-scale buildings may play in establishing a dialogue between new areas of urban expansion and the formal and typological characteristics of European cities. By looking at three designs by Jacques Herzog and Pierre de Meuron in the light of the early twentieth-century debate on urban design and the skyscraper in Europe, the problem of bigness will be seen as a continuation of a discussion on urban form and type spanning more than one hundred years. Bigness will thus be seen as a tool capable of reworking and even continuing existing urban formal types, even if devoid of ideological and symbolic meaning. Emmanuel Petit recently invoked the work of Colin Rowe to render a discussion of architectural precedent relevant for the digital age. Questioning Petit’s approach, this article explores the implications latent in this invocation. In so doing, it highlights their misalignments with the current concerns of digital design practitioners. The article thus focuses on the question of a possible after-life of Rowe’s formalism for the digital age. It starts by charting its genealogical development from Rudolf Wittkower’s humanist grids to Peter Eisenman’s ‘post-functionalist’ pursuits of autonomous form and Greg Lynn’s ‘pliant’ geometries. This showcases the dual historical effect of Rowe’s analytical formalism. From the late 1940s to the present, his disciples employed it both as a historiographical model and as a generative mechanism for architectural design. The history of Rowe’s formalism is therefore intertwined with the contemporary concerns of digital design practitioners, including Petit’s question of theorising precedent. The digital design practitioners’ assertions of autonomy are historically rooted in Rowe’s analytical formalism. In the final instance, Rowe’s analysis was carried out from the perspective of modernist humanism, and this historically remained the case in its various versions from Wittkower to Eisenman. Updating Rowe, as Petit suggested, would therefore only perpetuate a modernist outlook in a postmodern age. A formalism for the present cannot ignore the enduring points of the postmodern critique that preceded it. In conclusion, a contemporary variant of formalism needs to address the debates around its possible synthesis with contextualist concerns. To do so, it also needs to engage with the poststructuralist critiques of the intervening decades. Some examples from recent literature exemplify such an approach. They could therefore serve as useful precedents towards an integrated formalism for the present. This article questions the revival of ‘La Tendenza’ in the recent architectural debate, taking the work of Gianugo Polesello as a privileged vantage point. The Italian architect – along with Aldo Rossi, Giorgio Grassi, Guido Canella and other protagonists of that approach – taught in the Venetian PhD programme attended by the author, who recalls here his first-hand experience. The economic, ecological, and social crisis we are dealing with has generated, in academic discussions, a widespread re-emergence of political engagement, felt as a necessary alternative to the neo-liberal pensée unique that has dominated recent decades. Various important theoretical contributions from mid-1960s, such as the ambiguous mixture of populism and formal research, of radicalism and reactions against modernism, are therefore back in the architectural debate. Among the several approaches produced by that agitated moment, the Italian movement ‘La Tendenza’ contributed to redefine the disciplinary field in terms of language and autonomy, shifting its focus from design to composition and from the transformative attitude of the zeitgeist to a continuity with existing typo-morphological contexts. Gianugo Polesello, a partner in some early projects of Aldo Rossi – main protagonist of that movement – and a member, with Rossi and other young architects, of the journal Casabella’s ‘think tank’, shared that theoretical operation, conducted, however, through a more explicit and precise medium: architectural design or, more precisely, architectural drawing applied to design. His approach provides an interesting vantage, able to shed some light on a period and a generation that, at a closer look, appear less coherent than their latest reconstructions. The project of Rebière Street in Paris is the first housing project of Atelier Bow-Wow outside Japan. In the framework of the Porte Pouchet renovation project, a portion of the street along the cemetery was declassified to reduce its width and to build 180 apartments in the resulting free strip. The different plots were assigned to several local and foreign architecture offices. This project is symptomatic of an emerging practice in architecture that sees offices with discourses based on local anchorage taking advantage of globalisation to propose cutting-edge spatial quality in remote locations. The close reading of the project with tools provided by the sociology of engagement allows valuable insights in the production of form in remote practice. If human primary relation to the environment coincides with a regime of engagement based on familiarity, in remote practice the relation to the environment and the local anchorage are de facto mediated. This mediation implies a systemisation of the design process. The legitimacy of this systematisation is by nature questionable and can be a source of doubt or anxiety. Addressing the design process in relation to the ideas of scale of confidence, seizure, adherence and the explorative regime of engagement this article examines how the attempts of Atelier Bow-Wow to deal with the remoteness of the site influence the production of form. Three of the most influential chapters of Le Corbusier’s Vers une Architecture are collected under the common title ‘Des yeux qui ne voient pas…’ (Eyes which do not see…). Liners, airplanes, and automobiles are shown as the expression of the powerful beauty of practical form: honest, simple, functional and technological. These very famous pages remind us that form is not only derived from precise typological choices or from reasoned morphogenetic diagrams, but it could also be a direct expression of the Kunstwollen. What are the paquebots of the twenty-first century? Which buildings embody this new paradigm? This graphic analysis starts from the statement that one of the ‘not seen’ features of this era is the smartphone. The subject of the survey is the first BMW Guggenheim Lab, designed in 2010 by Atelier Bow-Wow. Described by the architects themselves as a ‘travel toolbox’ or ‘pop-up fly loft theatre in the city’, this compact architecture is the incarnation of three interesting formal qualities usually associated with smartphones: the clear division between the hardware and the ergonomic user interface; the possibility to operate different functions (or software) in the same space (or screen); and the real and virtual connection with different urban situations.